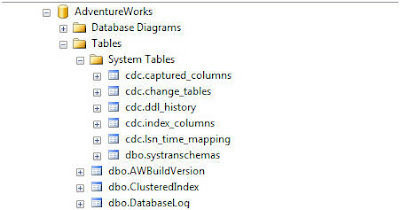 CDC is one of the new data tracking and capturing features of SQL Server 2008. It only tracks changes in user-created tables. Because captured data is then stored in relational tables, it can be easily accessed and retrieved subsequently, using regular T-SQL. There should not be any schema with a name "cdc"
This will create some columns under "cdc" schema which will be introduced. Low development cost, easy maintenance, clean approach of tracking audit. 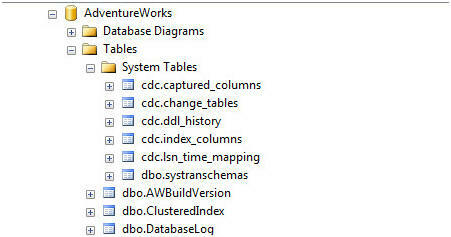 If a new column gets added or existing column gets removed, it does not reflect CDC table. Alternate solution is, cdc should be disabled and enabled. NVARCHAR(MAX), VARBINARY(MAX) columns will be part of each update operation even though their value is untouched. Ex. In a table, there are 4 columns. Out of this one column in NVARCHAR(MAX). Assume that 1 int column value has been changed but NVARCHAR(MAX) is untouched, still in CDC table, it will be tracked as the previous value was NULL and new value is existing value.